FILM PLATFORM serves as a bridge between academia and documentary film, bringing students and professors the most relevant and highly regarded films from the festival circuit. The collection is curated by film experts and leading academics to showcase critically-acclaimed documentaries of social, political and cultural importance, and the catalogue is continually growing. 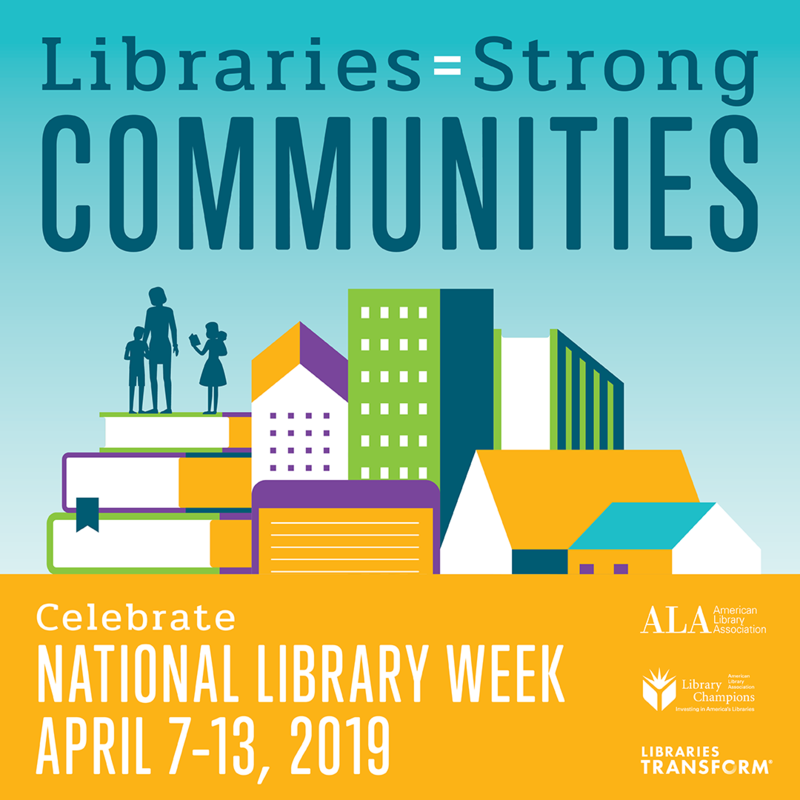 Check out our Library Week page for details on all the events. New trivia questions posted each day! Both O’Shaughnessy-Frey and Ireland libraries will be having their annual book sale, featuring donated and withdrawn material. This year, Fallon Advertising Agency donated their entire print library. This includes hundreds of beautiful art and photography books and other books for visual inspiration. Do not miss this! Ireland Library book sale and silent auction: Monday – Friday, normal business hours, in the reference room. Find librarians and donut holes at the CSA (1st floor Murray-Herrick) where you can ask for advice on holes in your research. Late Night Scavenger Hunt, in OSF library, 10:30 pm. Preregistration requested. The Feature Films for Education Collection offers hundreds of full-length feature films for educational instructional purposes. The Collection focuses on both current and hard-to-find titles, including dramas, literary adaptations, blockbusters, classics, science fiction, environmental titles, foreign films, social issues, animation studies, Academy Award® winners, and more. NOTE: If you have issues playing a film, clean all your browse history, cache and cookies. Hoopla provides streaming video (movies and TV shows) and audiobooks. Popular titles and classics, fiction and nonfiction are available. For information about devices and more visit Hoopla help. Play with Eastern bookbinding techniques! We invite you to register for a workshop on Japanese Stab Binding! 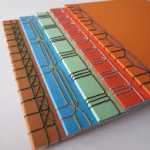 Experts from the Minnesota Center for Book Arts will help you create a journal that you can use as you wish! Come to the O’Shaughnessy-Frey Library, Room 102, on Wednesday, April 10 at 10am for an hour-long class. Materials will be provided for you at no cost. Limited space is available so be sure to RSVP to to Merrie Davidson by noon on Wednesday, March 27! Alec Johnson: Alec Johnson, whose primary teaching interest is Innovation has taught for 18 years at the University of St. Thomas in Entrepreneurship. 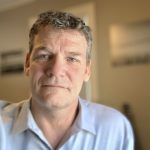 He is a Julie Hays Teacher of the Year (Opus Business School), and owns several businesses including his freelance photography business (www.acjfineartphoto.com). Steve Cole: Dr. Steve Cole is Head of Music Industry Studies and Recording Arts at the University of St. Thomas. 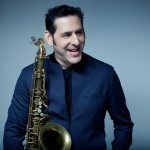 As a jazz musician (saxophonist) Dr. Cole has eight major label solo releases, and has published over 150 original works. 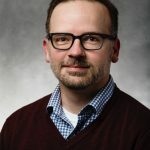 His research in organization development & change explores how music based interventions can build individual and organizational capacity for creativity, agility, and dynamic capability. All tucked in and ready to go home after a fun night cuddling with Tommies! 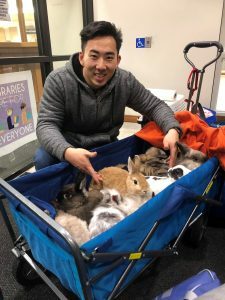 O’Shaughnessy-Frey Library student worker, Hongwei Cui, helps nine bunnies and one Guinea pig snuggle into their wagon for a ride to their vehicle and a good night’s sleep. The animals had been busy befriending students at the March 14th Therapy Pets Night in the Library! Bunnies, Guinea pigs, and dogs will be back at the library on Thursday, May 16th, from 6-8 pm. Open to all – we hope you can come! In need of an invigorating musical performance this summer? Visit The Music and Media Collections on the first floor of the O’Shaughnessy-Frey Library and pick up one of our Deutsche Grammophon video recordings. 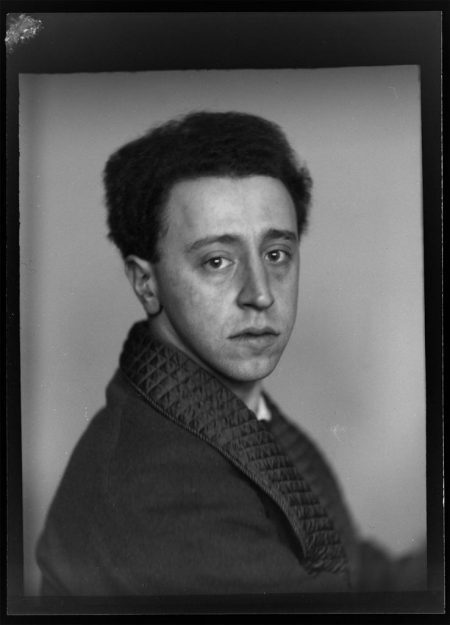 At the age of 88, world-renowned Polish American classical pianist Arthur Rubinstein performs classical piano compositions by Edvard Grieg, Frederic Chopin, and Camile Saint-Saens. Andre Previn conducts this beautifully powerful performance. Additional classical concerts can be found streaming on the classical music collection Medici.tv. In addition to opera, Medici has many instrumental performances like the excellent chamber music group The Psophos Quartet. This French-based group performs string compositions by Edvard Grieg and Claude Debussy with great energy and poise. Please send your comments about this resource to Cindy Badilla-Melendez, Head of Music & Media Collections. All are invited to attend the March 5th noonartsound presentation, featuring Drs. Craig Eliason (Art History) and Vanessa Cornett (Music), speaking about Art and Music as Contemplative Experiences, at noon in the O’Shaughnessy-Frey Library, Room 108. Dr. Craig Eliason is a professor in the Art History department and teaches courses on modern art and design. He researches the history of the design of printing types, and is a practicing type designer as well. 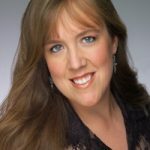 Dr. Vanessa Cornett teaches piano performance and other courses in the Music department. An advisor for the UST Project for Mindfulness and Contemplation, she enjoys exploring the applications of mindfulness in the performing arts, and contempative practices in higher education. Chris Kachian, Music department professor, started moderating noonartsound 8 years ago with Shelly Nordtorp-Madson. It began as a demo-lecture series of music performance and talks by art historians, and has morphed into everything from politics and propaganda, leadership and motivation, music and monuments, etc. Hosted by the Library in the O’Shaughnessy Room at noon six times throughout the academic year, all are welcome to bring lunch and enjoy a light dessert. Please plan to join us! Bring your lunch if you wish – light dessert will be provided.